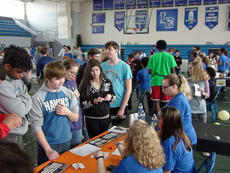 Games, booths, and volunteers provided students with a platform for schools and communities to strengthen social ties and coping skills as LaRue County High School hosted its first Sources of Strength Carnival March 29 in the school’s gym. The LaRue County Pork Producer Association is accepting applications for the 2019 Donald Slinker Memorial Scholarship. This $500 scholarship is for a LaRue County High School senior or an adult planning to earn a degree in Agriculture, Family and Consumer Science or a related field. Applications can be picked up at the LaRue County Extension Office at 807 Old Elizabethtown Road, Hodgenville. Deadline is April 15. LaRue County Farm Bureau will offer a total of $5000 in College Scholarships in 2019. These include four (4) $1000 college scholarships open to high school seniors who will enter college this fall, to undergraduate college students, and to adults interested in entering college or continuing their college education. Preference will be given to applicants pursuing careers in agriculture or related fields. The LaRue County School Board has announced changes to their regular scheduled board meetings for the next two months. Due to the Martin Luther King Jr. holiday falling on the scheduled third Monday of the month in January, and President’s Day on the same for February, the dates and locations have been changed. In January, the board will meet at 7 p.m. on Tuesday, January 22, and will meet at Abraham Lincoln Elementary. For the February meeting, the board will meet at Hodgenville Elementary at 7 p.m. on Tuesday, February 19. The academic honors’ president’s list for the Fall 2018 semester has been announced by Dr. Donna Hedgepath, Campbellsville University’s provost and vice president for academic affairs. Laurel Kassandra Locke a freshman, from Hodgenville, Ky.
Alexia Brooke Trumbo a freshman, from Hodgenville, Ky.
Richard Andrew Hughes a sophomore, from New Haven, Ky.
Andrew Wayne Coy a senior, from Hodgenville, Ky.
Marissa Danielle Lew a senior, from New Haven, Ky.
Taylor Nichole Harvard a senior, from Upton, Ky. The academic honors’ dean’s list for the Fall 2018 semester has been announced by Dr. Donna Hedgepath, Campbellsville University’s provost and vice president for academic affairs. Keeahna Aleise Bowen a junior, from Magnolia, Ky.
Scott Oliver Dickinson a post baccalaureate student, from Upton, Ky.
Nicholas Steven Sullivan a junior, from Hodgenville, Ky.
Anna Lee Webb a freshman, from Magnolia, Ky.
April Marie Webb a freshman, from Magnolia, Ky.
WHERE: Interested students can apply at www.kentuckycentergsa.org. 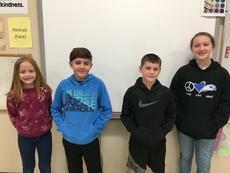 Bryan Hurst’s seventh-grade students at LaRue County Middle School have come up with a creative recycling idea that not only helps keep the earth cleaner but also provides a beneficial byproduct. “We used nearly 5000 plastic water bottles, sports drink bottles, small soda bottles, and 2-liter soda bottles to create a plastic greenhouse,” said the seventh-grade science and STEM (science, technology, engineering, and math) teacher. Lacy Hatfield, a fourth-grade grade math and social studies teacher at Hodgenville Elementary School, is the recipient of LaRue County Schools’ 2018-19 LG&E KU and WHAS-TV Excellence in Classroom and Educational Leadership(ExCEL) Award. 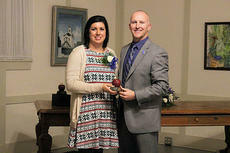 “I am truly honored to be LaRue County’s ExCEL teacher,” said the 15-year teaching veteran.